Beauty, rarity and durability - these are the attributes that make a gemstone. 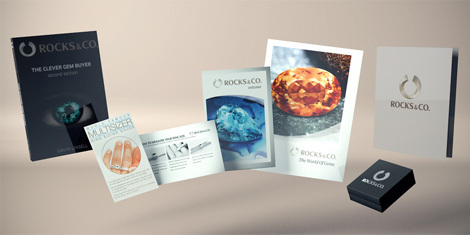 Discover fascinating gems at Rocks & Co., in our Gemstone Library you will learn everything you need to know about jewellery and gemstones. Learn more about your favourite gemstone, read about well-known gemstones such as Diamond, Emerald and Ruby and discover lesser known gems like Tanzanite, Tourmaline and Topaz. We explain the composition and characteristics of each gemstone plus information about the history and mythology surrounding individual gems. Learn what makes each gemstone unique and find which suits you best! Under “General Information” you can read the basics about coloured gemstones. We explain the four C’s (Colour, Cut, Clarity and Carat Weight), and how to use these important criteria in evaluating gemstones. Learn how lustre, brilliance and fire make a gemstone so distinctive and read more detailed information on gemstone special effects such as Chatoyancy (cat’s eye effect), Adularescence (Opalescence) and colour change gemstones. You can also find information regarding the precious metals we use, the different settings that suit each gemstone cut and jewellery wearing tips in the “About Jewellery” section. An important part of owning gemstone jewellery is knowing how to take care of it, learn the best ways to care for your gems, and their treatments, in our enhancement and care guide. Looking for a gift, but can’t decide which gemstone to give? We have compiled a list of birthstones, astrological gems, Chinese astrological gems and anniversary gems to help you decide on the perfect piece of jewellery! Immerse yourself in the world of gemstone jewellery! Diamond: Its fabulous fire, dazzling brilliance and glistening lustre lend the birthstone of April its superstar status in the world of gemstones.